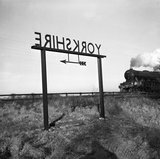 Train approaching a 'Yorkshire' sign on the boundary with County Durham, 1951. 'North Wales Radio Land Cruise', 1959. British Railways poster, 1959. Great Central Railway expres, 1899. The Royal Waiting Room at Paddington Station, London, c 1905. Nasmyth Wilson & Co loco for the County Donegal Railway, c 1930s. 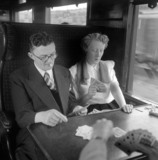 Passengers playing cards in a railway carriage, 1950. View of Wakefield on the Manchester & Leeds Railway, 1845. 'Perhaps this'll teach you to stay at 'ome next 'oliday', poster, 1944. 'Aberdonian', steam locomotive, King's Cross Station, London, 1958.